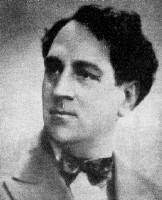 The tenor, Stefan Makedonsky, was born 25 March 1885 in Sliven. His mother was a folk singer. In 1902 he left for Russia where he started his vocal studies. After a year in Russia he was accepted in the Moscow Conservatory as a student of Korssi. He returned to Bulgaria in 1910. Following his debut with the Operna Drushba on January 5, 1911 and following additional engagements he traveled to Paris to study the French repertoire. In 1916 Makedonsky left for Berlin where he studied the Italian roles with Marini in addition to guest appearances with the Berlin Royal Opera, Hanover and the Cassel Opera. From 1922 to 1933 he was a principle soloist with the Sofia Opera. During the First World War he performed numerous charity concerts. In addition to his stage activities he was the Artistic Director of the Varna Opera from 1930-1932 where he produced not only operas of the Italian composers but also of his fellow Bulgarian composers. In 1934 he founded the Traveling Opera Company and until 1937 was responsible for their productions. He became the Director of the State Music Theater in 1948. Major roles in his career included Radames, Otello, Alfredo, Don Jose, Tannhäuser, Manrico, the Duke in Rigoletto, Pinkerton and Canio. Later in his career he turned to roles of the operetta repertoire. Following his death on May 31, 1952 the State Music Theater was named after him. Tchaikovsky: Eugene Onegin "Lensky's Aria"